1 drawing on paper mounted on cardboard : pen ink over pencil ; cardboard support 4 x 5.25 in. 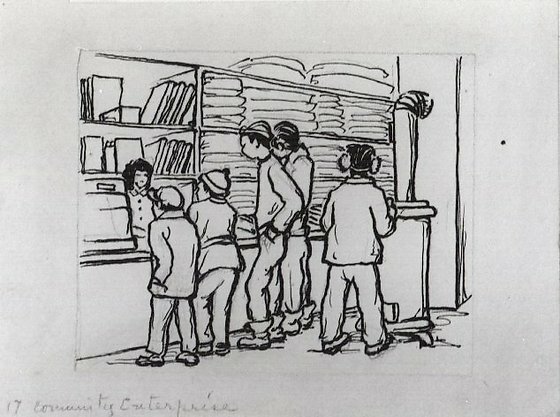 Ink drawing of five boys in a co-op in a United States concentration camp. Four boys stand at counter with backs to the viewer as a woman near register helps them. Fifth boy with earmuffs stands behind them facing a furnace on right. Goods for purchase are stacked on shelves behind counter. Ink drawn over pencil sketch. Pencil line border. Taped to carboard. Written in pencil, bottom left: 17 Community Enterprise.